Chemda was born in Israel and has lived in New York City since she was 4 years old. She currently lives in Queens with her fiance, actor Lauren Hennessy. She is a talk show host, writer and singer. Chemda hosts the What’s My Name show, a themed talk show. She also co-hosts as ‘The Girl’ of Keith and The Girl (KATG), a daily, award-winning comedy talk show with comedian Keith Malley. Chemda’s first published book, What Do We Do Now, was released March, 2010 and went into its second printing within one week of its release. Written with KATG co-host Keith Malley, the book offers comedic yet sincere relationship advice. The book can be found anywhere books are sold. 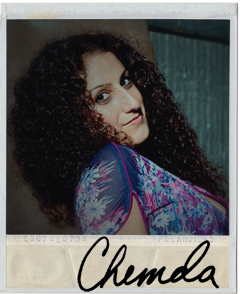 Chemda made her first professional appearance in 1995 on well-known reggae artist Dr. Israel’s second album. Since then, she was the lead singer and choreographer for Mighty Dub Katz; featured on Comedy Central aside comedian Jeff Ross; and teamed up with Rhys Fulber (formerly of Front Line Assembly) for Conjure One as writer and singer, with songs featured on ESPN and EA Sports’ FIFA 2002. Along with recent European tours, Chemda completed a US/Canadian tour as the sole vocalist for Conjure One, performing in venues such as Commodore Ballroom, Vancouver, BC and Irving Plaza, NYC. She has recorded vocals for the follow-up album to Conjure One entitled Extraordinary Ways. Chemda is a singer/songwriter on the album Patterns of War as part of dubstep band Dreadtone International. She recently finished recording the album for the rock-musical Viva Patshiva, and she continues to write and collaborate with various artists around the world. Check out Chemda’s holiday album, Christmas Classics by The Girl and right now, you can download her original song Surrender at a ‘pay what you want’ price here. You can also purchase voodoolulu’s Meooow Royale, which features Chemda on vocals.